I have not been kind to this series at all. In this intro I could rip apart what exactly what went wrong with this series, however just read my reviews of previous issues to understand the crux of my arguments. Some might say that I’m not being fair, since Lost Army was a twelve issue story that became truncated into a six issue mini series. So hopefully before Tom Taylor and Ethan Van Sciver start their Green Lantern mini series in 2016, let’s see if we can’t have an enjoyable send off from this forgettable series. Just getting the negative aspects of this issue right out of the way, which to my surprise weren’t that many. After several pages dedicated to a flashback sequence in previous issues, it’s not surprise that there is absolutely zero resolution to whatever Cullen Bunn was trying to portray with these scenes. If the point was to understand the mind of a person in the military and how their training stays with them even though they’ve left the battlefield, it’s not a nice gesture but it doesn’t have a payoff. Everything thing Jon did in those flashbacks could have been incorporated into the main story, while also fleshing out the non humanoid lanterns. 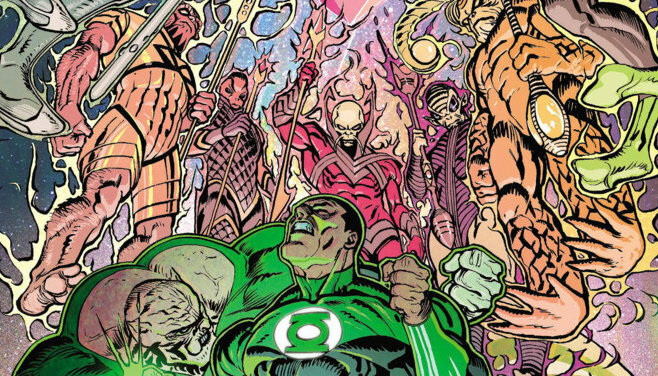 Green Lantern Lost Army is a perfect example of why flashback sequences in comics can hurt more than help a monthly story. Plus there’s no guarantee that the Tom Taylor will even make John the focus in the next mini series (considering the cast just grew exponentially). Two characters that could have added an extra spice to the series were Krona and Relic prior to their future evil endeavors, but somehow (in a panel that we didn’t see) Krona has discovered John Stewart’s lie and it appears that Relic and Krona will be in opposition, but it’s not a moment earned. Other than we already know both of these characters will eventually turn to the dark side. While it seems that Bunn wanted to explore more of this plot, but the premature cancellation of Lost Army have put those plans forever on hold. Outside of that, I have to give credit to both Bunn and Saiz for delivering a thrilling and well paced action sequence. While using Mogo as a battleground is nothing new, but it doesn’t take away from the spectacle that it provides, So in terms of action, Lost Army did a fine job of delivering a fun battle sequence. Jesus Saiz stepped up his game with dynamic panels and set pieces that make the action come to life, plus it was nice to see him draw more non humanoid aliens on screen. I really liked this series, and the flashbacks seemed to add depth to the story. I keep wondering if you might have been turned off by something other than the story…it seems solid to me, I’m really into what’s going on. Looking forward to Edge of Oblivion.